The Sewer Den, the room where my collection of TMNT goodies are on display, has sprouted from an exciting idea into a major success. 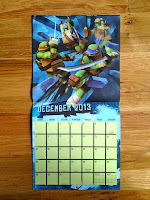 Not long ago, my Ninja Turtles treasures were stowed away in a dingy basement, out of sight and gathering dust. But now, these prized-possessions have morphed from hoarded nostalgia into priceless trophies - on display for the world to enjoy. 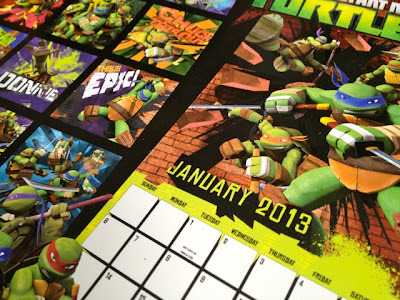 The stockpile of TMNT valuables has eaten up the vast majority of wall space. From floor to ceiling, the green machines reign supreme. The Ninja Turtles lived gloriously in their heyday - hailed as a phenomenon from the late 80's to mid 90's. Most of my collection is from this golden era. But in 2003, the brothers returned to TV for an encore. 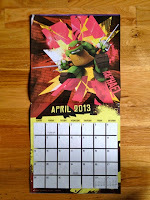 Their new series proved successful and my TMNT collection continued to grow as a result. With new episodes, came new purchases. 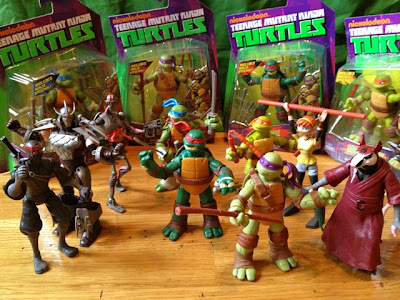 When that cartoon ended in 2009, my TMNT collection found stability. 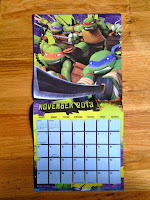 The Ninja Turtles went back into their shells, and in some ways, I did too. Enter Nickelodeon. In 2012, the network went for a ninja hat trick. 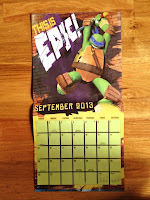 For the third time, the Turtles hit TV sets across the world with a brand-spanking new cartoon. And for the third time, I loved the Teenage Mutant Ninja Turtles. 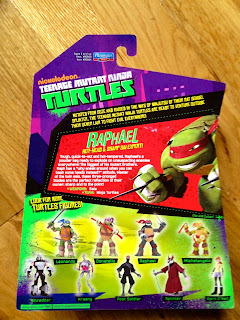 Again, with new TMNT adventures comes new TMNT merchandise. 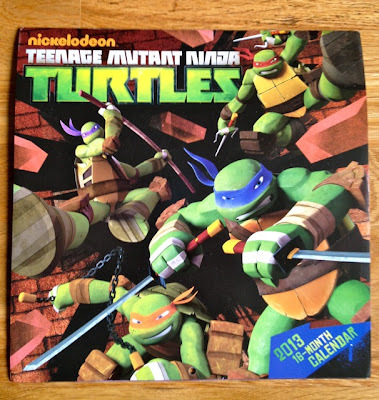 Nickelodeon has been releasing a slew of must-haves for diehard fans. But when you're someone like me, a person with their own personal Sewer Den, who has room for new stuff in an already extensive collection? At first, I battled the temptation. No new merch for me. This time, I was drawing a line. But with one look at the Turtles in their new form, the resistance was over. I buckled at the knees - surrendering to the Nickelodeon Turtles. Nickelodeon, welcome to The Sewer Den. Your vision of the Turtles proved successful. You pulled the nostalgia straight from my bones. You ignited the TMNT spark. But most importantly, your take on the Turtles is now in my collection. No Turtle leaves the sewer without their eyewear. 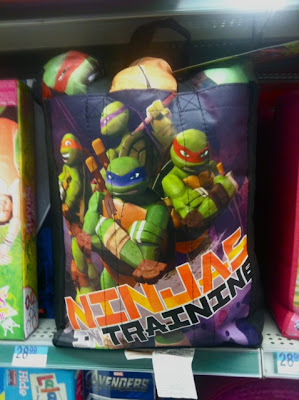 It's the main attribute to their ninja ensemble. Without them, the Turtles are pretty much naked. And no one wants a naked Turtle. At first glance, these bandanas could be from any incarnation of TMNT we've seen over the years. But then you spot it. 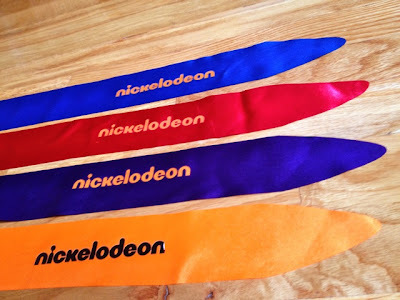 That slick Nickelodeon logo. These puppies are definitely new to the collection. The gang is all here. 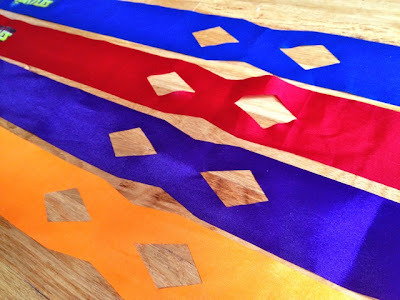 4 colors for 4 Turtles. Simple and sweet - but quintessential for fighting the Foot. 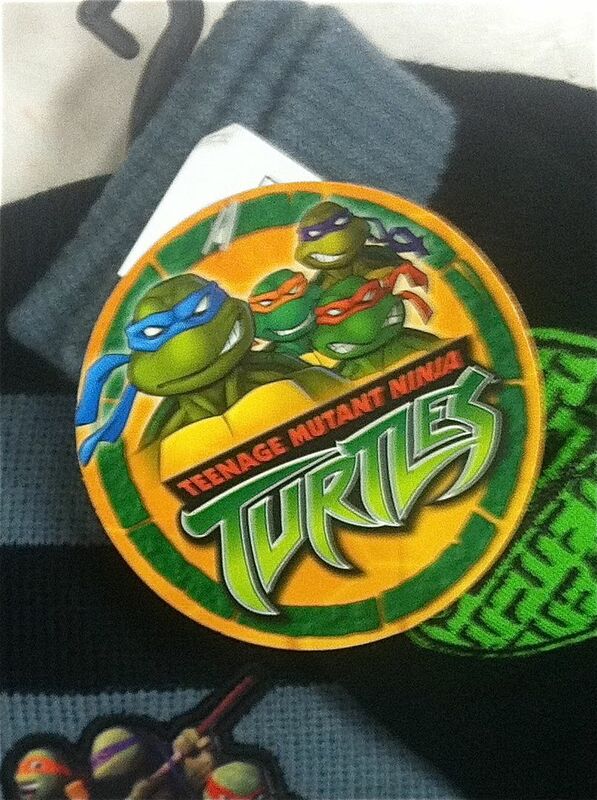 The TMNT logo has evolved. That iconic 80's style has been revamped for a new generation. And this time around, Nickelodeon is leading the way. Rolling your eyes at this piece of merch? Understandable. The thought of cell phone stickers is a bit gimmicky. But, if you've lived through the rise and fall of the Turtles from the 80's, you can find some appreciation. How? Pretty simple. This item wouldn't have existed 20 years ago! Back then, it was walkie talkies and corded phones. If you were lucky, your family owned a wireless phone for the house - one of those relics that lost reception beyond your mailbox. The cell phones of today just weren't on the map yet. As a kid, you never saw one in real life. They seemed exclusive to business men in 90's sitcoms. A pure fantasy. Ah, how the times change. Society has embraced the cellphone existence. All around the globe, people are plugging away on their touch screens and staying connected through the internet. Eye contact is barely made, while the text message is continually reaching new heights of popularity. And it's not only adults, but kids are in the mix too. 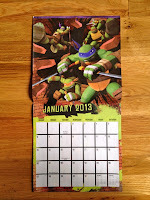 Time for the Turtles of 2012 to cash in. Where there are merchandising opportunities, there are the Teenage Mutant Ninja Turtles. Ring ring, cha-ching. 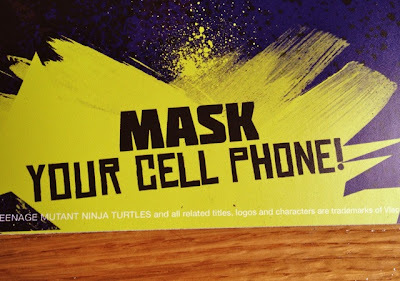 Cell phone stickers encompass everything I loved about the classic TMNT merchandise. They're silly and possibly pointless, but as a kid, you NEED them. Slap them on your cell and that iPhone transforms to a T-Phone. Technology. The Turtles have a new tool at their fingertips. The cell phone is going to unleash a whole new realm of merchandise. This is just the beginning. 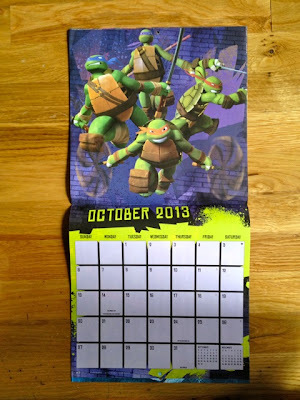 They've come and gone since their incarnation, but TMNT calendars have returned. I never thought I'd get another opportunity to hang the green machines from my walls again. 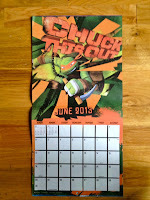 Until recently, if you were peering into a TMNT calendar, it was a window into the past. The visuals inspired from the classic cartoon and comics sat above the months of a yesteryear. 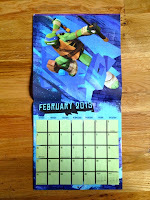 This new calendar dives into a brave new world and features the Turtles from the Nickelodeon universe. 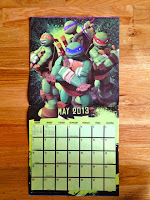 Battle-ready for 365 days, Raphael, Leonardo, Donatello, and Michelangelo shell out the action. 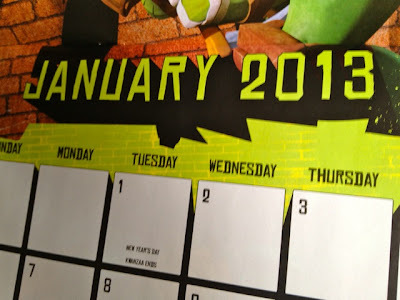 But, this calendar stirs up a new emotion. A curious awe overtakes you while thumbing through those 12 months. 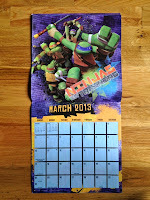 For the first time in years, the Turtles calendar hanging on my wall is looking ahead, not behind. This provides a true realization - the Turtles are back. It's the return we had all hoped for, but never anticipated. The Turtles are surprisingly fierce. 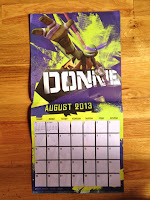 They're always in an attack-mode on this calendar - flying and jumping around from month to month. Their usual mix of goof and grit is strangely absent. It's 365 days of pure Ninja-ness. If only it were a Leap Year! Sweet dreams couldn't be any sweeter. The Turtles team up with the Sandman to bring bedtime back to the sewer. This kit packs a pillow and slumber sack (fancy term for a sleeping bag?) that can be conveniently stuffed into the included tote bag. For kids, it's the perfect set for those last minute sleepovers. 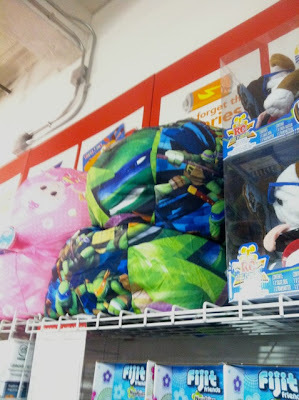 My head is no stranger to TMNT pillows. I've rested my noggin on several comfy cushions the Turtles released over the years. Heck, I even had the matching curtains! That TMNT bedroom collection transformed my small childhood bedroom into my own personal sewer den. Now, the kids of today have that same opportunity thanks to the Nickelodeon Turtles...and that opportunity can fit conveniently into the included tote bag! Convenience. All of our ninja gear now fits in this tidy little tote. This practical idea never made its way into the merchandise of the 90's. Also the term "sleeping bag" has mutated into "slumber sack." When you venture outside of your bedroom and into the cold weather, have no fear, staying warm with Nickelodeon TMNT merch is still possible. I don't actually own this winter hat, but stumbled upon it in a NYC department store. Why didn't I buy this killer ninja head-ware? Well, it's for kids. This usually isn't an issue, but with clothing, sadly it is. It's just a bit too small. Growing up, bah. Did you catch something strange about this winter hat? 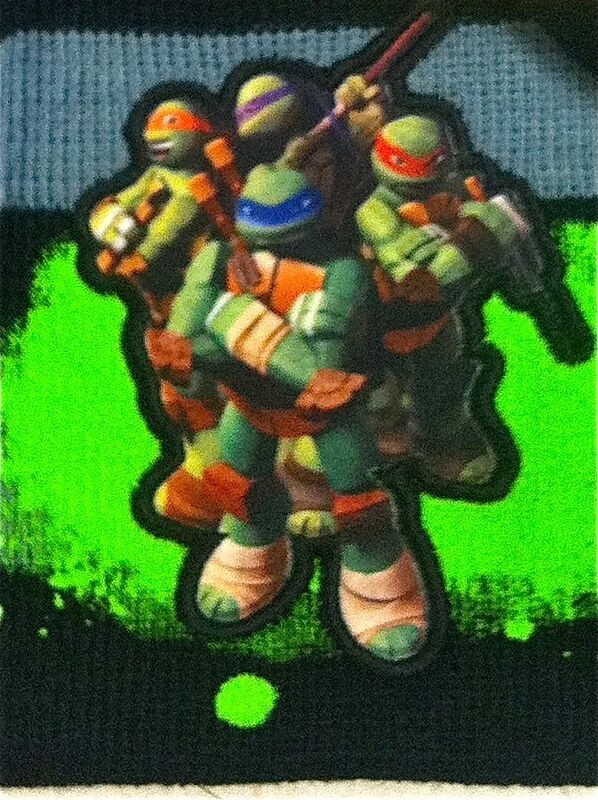 The tag grabbed my eye immediately - TMNT universes colliding! 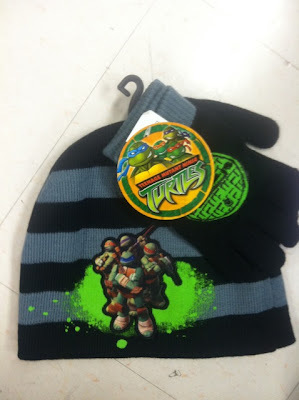 The hat itself features the Nickelodeon Turtles while the tag showcases the green machines from the 2003 cartoon series. The forces of new and old have teamed up to sell some head-ware. Marketing strategy or major mistake? For longtime fans, it falls into the column of cool crossover. If 2 heads are better than 1, 8 Turtles must be better than 4, right? 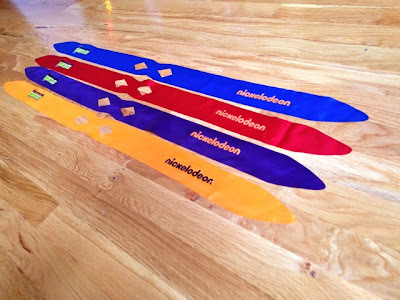 There are plenty of ways to watch the Nickelodeon Turtles episodes. For many of us, I'm sure a ritual has formed. Snuggling up on the couch, lying in your slumber sack, or watching with a tasty breakfast - every Saturday morning is a mini-celebration. But, maybe there's a better way to watch your favorite Turtle defeat the Foot Clan. Let me tell you, there is. Nothing can possibly top a TMNT bean bag chair. Unfortunately like that cap, the bean bag chair slipped through my fingers and escaped joining my collection. The treasured item was out of reach behind the store counter, on layaway, and awaiting pickup. Some lucky shopper beat me to it. There weren't anymore in stock either - the place was completely cleaned out. 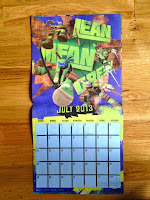 So until I can track down another TMNT bean bag chair, I'm forced to wait. Talk about turning green with envy. Although they've been rebooted a handful of times, the Turtles still have a few tricks up their sleeves - especially when it comes to merchandise. The bean bag chair is a solid entry to the countless creations TMNT have released over the years. Even if it has always existed, it's new to me! 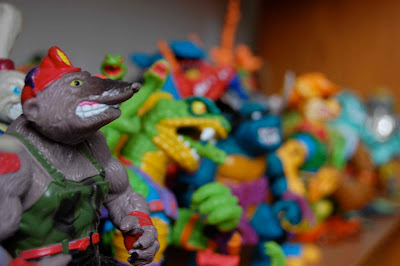 There wasn't a kid in the 90's who didn't own a Ninja Turtles action figure. 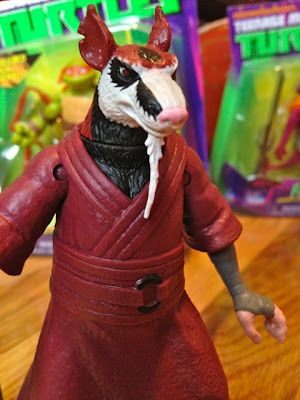 Everyone had their favorite masked reptile in plastic form. If you were like me, you had all 4 Turtles (and every mutant in between) in your toy collection. Store shelves were stacked from top to bottom with the action figures. It was unavoidable. Turtle toys were everywhere. 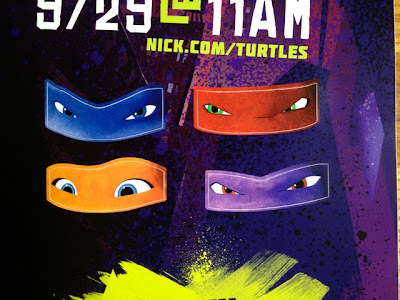 So, Nickelodeon hopes to successfully revitalize the TMNT franchise? The key factor? Well, history repeats itself. 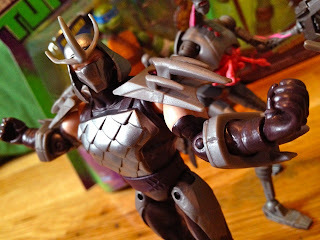 Create a killer line of action figures. 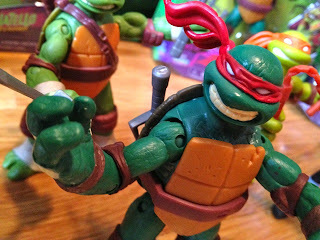 As of now, Ninja Turtles are the third most selling action figure line of all time. So it's simple. If you build it, they will come. 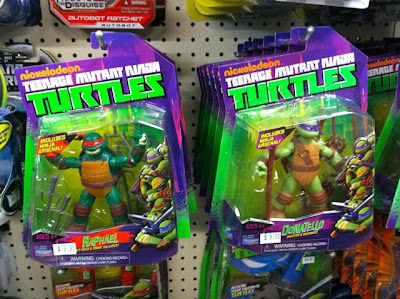 Playmates' new line of Nickelodeon Turtles is a welcome entry into the franchise. The first wave is a fresh take on the classic toys while still retaining much of their original appeal. Those figures from the 80's had a simple agenda - good guys vs bad guys with no gimmicks. 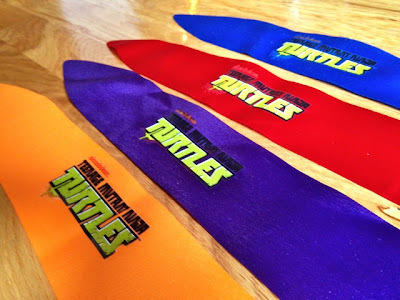 Each Turtle toy came with their appropriate weapons - no silly accessories like roller skates or even pizzas. Playmates strikes that simplicity again. These figures are all about introducing you to the (new) world of Ninja Turtles. On a hot August day this past summer, I wandered into a small, family-owned toy store in Brooklyn, NY. I had no agenda - just entering the shop to explore this land of toys. I wasn't expecting a whole lot. 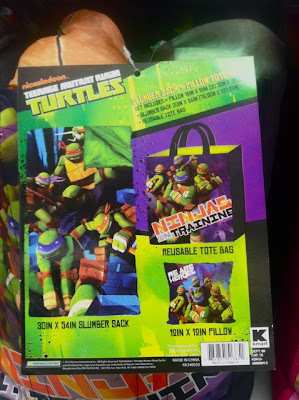 But to my sweet surprise, the shelves were lined with new Nickelodeon Turtle toys. A wave of nostalgia swept over me. 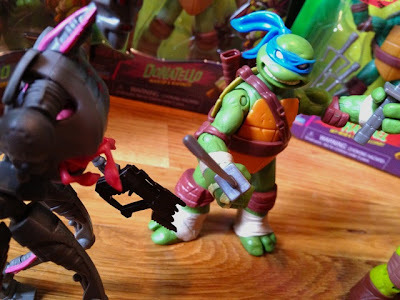 I was teleported back to a time when Kiddie City and Kay Bee toy stores ruled America's shopping malls - where one came across new TMNT toys quite often. It was a much missed familiar feeling. I remained planted in this Brooklyn toy store, embracing my memories from the past. Patience. 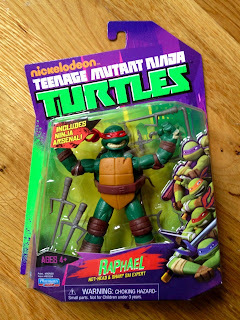 That day, I only bought two toys (Raphael and Leonardo). I eventually got them all, but spread those purchases over a couple months rather than a single afternoon. 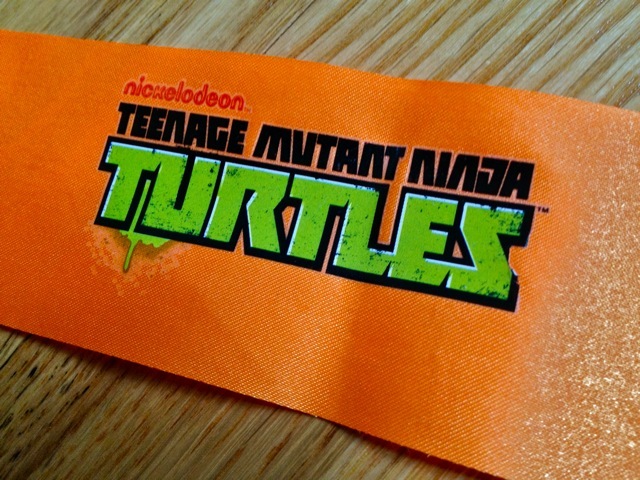 Trekking into toy stores in search of the Nickelodeon Turtle toys became a ritual - lined with an odd, new-nostalgia. The gang has been visually overhauled, but nothing to scare off a diehard fan. 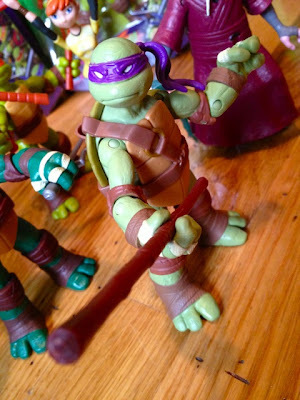 These TMNT action figures still manage to strike up a familiar feeling. It really is comforting to collect these toys once again. Third time's a charm, right? 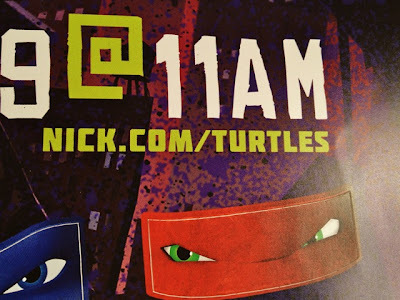 Let's hope Nickelodeon keeps the killer momentum alive on their new TMNT series. The longer the show lasts, the harder the merchandise hits the shelves. The gimmicky ideas are endless. Maybe a Ninja Turtles toaster? Or a Kraang coat hanger? It all sounds silly, but I'd be the first one at the register, throwing down my hard-earned cash. The Sewer Den is packed to the gils (eh, shell?) 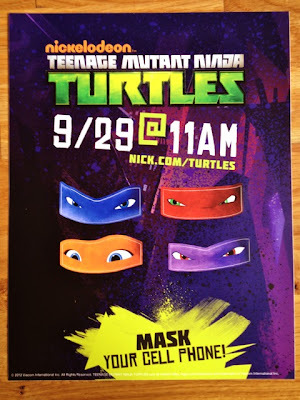 with TMNT materials already, but Nickelodeon has left me no choice. The collection will keep on growing.